Lisa's Carolina | Handmade: 'Dreaming of Spring' Quilt | Finished! 'Dreaming of Spring' Quilt | Finished! 'Dreaming of Spring' worked its magic as Spring seems to have arrived here, in the Mountains of South Carolina. And what a pleasure to work on these colors of Spring as the winter storms passed through our area. Before washing/drying the quilt measured 40 1/4" x 40 1/4". After washing/drying (as you see here) the quilt measures 38" x 38 1/2". First time using flannel as a backing and it was no problem at all to quilt. The flannel was pre-washed and dried prior to sandwiching/quilting. Washing and drying really brings out the quilting. Love it! 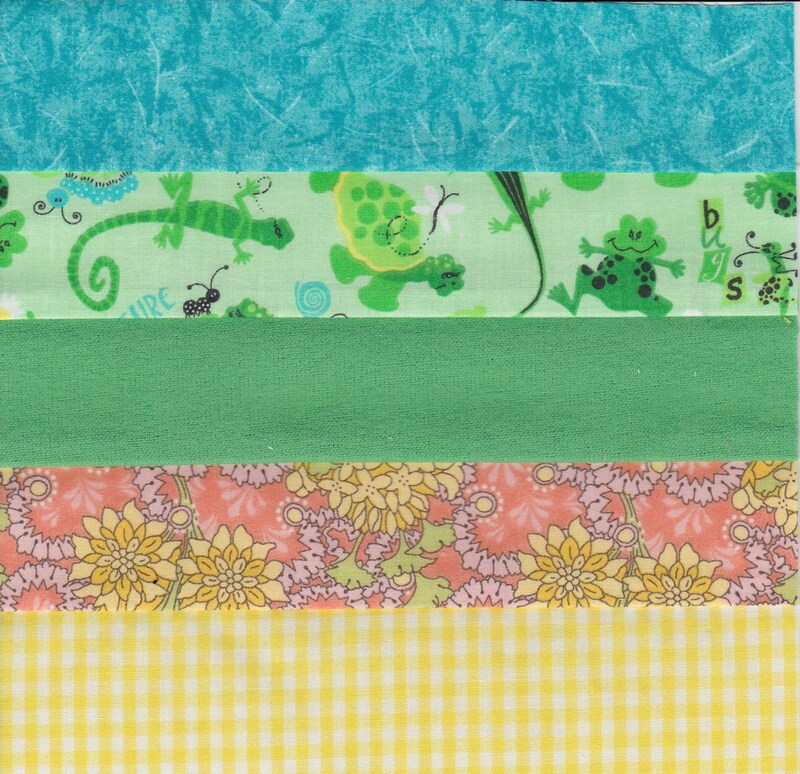 I could hardly WAIT to see all the quilty goodness. Kinda felt like Christmas waiting for the dryer to finish its tumble dry cycle. :) Everything was machine quilted using either a straight stitch or an elongated running (wavy) stitch. The new walking foot made the entire quilting process such a pleasure. For this quilt used a new binding technique that I LOVE! You can see the video here. Project Notes: cut binding strips 2 1/2" wide, sew to front first, no pressing, pin sideways, stitch in the ditch in the front catching the back. Go slow and this is the best machine stitched binding technique I've found. Thought you might want to see my 'inspiration'. This quilt was built around this adorably cute fabric. One of my pieced blocks show the sky, happy critters frolicking in the green grass, soft earth and daffodils. The strip representing the 'green grass' was a flannel from my stash that I had wondered why in the world did I buy a solid color green flannel fabric?! It worked perfectly in this quilt and this piece being flannel adds a bit of texture to the front. 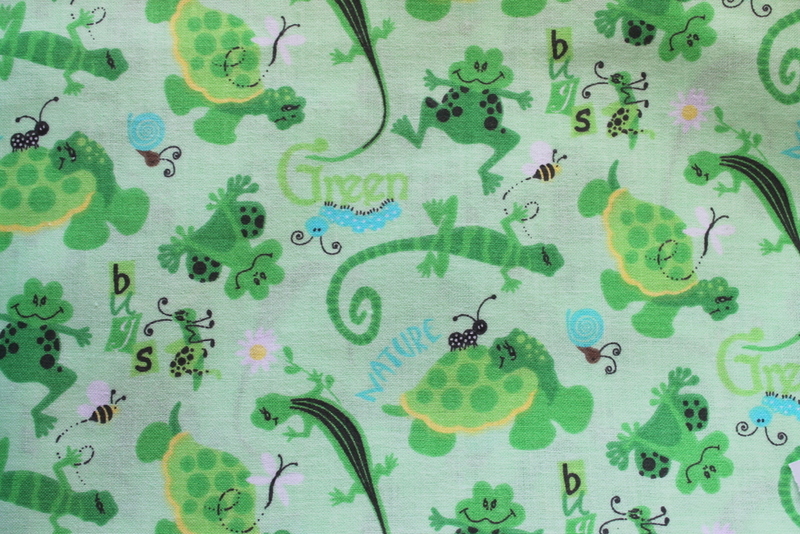 All the other fabrics are 100% cotton and the batting is 100% cotton. ....and daffodils are my absolutely favorite Spring flower!!! Love 'em! Even love the way they smell! The more quilt projects I complete the more I love quilting! Already planning the next! Happy Sewing Everyone! Just gorgeous, Lisa! Isn't it true that quilting makes the quilt? You did A LOT of quilting on this one and it made it very special. Buster would show much more enthusiasm if you had put the quilt on the seat of "his" chair so he could test it out up close and personal!! Thanks for sharing this one with all of us. Just adorable! Absolutely! Quilting 'makes' the quilt. Thank you so much Mama Pea! So pretty! I love piecing quilts but not so keen on quilting, even with a walking foot. Yours is beautiful and I'm making a note of your binding method. Thank you Kathy! I practiced this binding technique on a sample piece first, then was ready to go on this quilt and it worked almost 'magically' catching the back perfectly. Good Luck! Gorgeous was the first word that sprung to mind too. Love the colours, so fresh - perfect for spring. It's beautiful, Lisa, and such a perfect reflection of Spring. I've started my first quilt through a Quilting 101 class at a local shop. Gah. It's tedious and I'm finding no joy whatsoever in it. Perhaps when the squares are lined up and I can start playing with color and pattern layout, it'll be more fun. Right now, though, it's a chore to work on it. Your beautiful quilt is an inspiration to me to keep plugging along. Hang in there Barbara.... you will find the joy!! I've come to love quilting the more I've pieced and quilted.... with this quilt being pure joy at every step. With your sewing experience you're already way ahead. Love to see what you make!! Thank you Sarah Liz! Quilting and garment sewing seem to be two completely different categories. I like both. To me, each complements the other beautifully so there's no burnout on either one.